The huge sandy expanse at Ryde on the north-east coast of the island make it the perfect place for beach games. The very gentle slope of the shore means it is great for paddling in the shallows – but there is a long walk to get there when the tide is out! It’s these gently-sloping sands that make Ryde’s very long pier necessary too. Boats from Portsmouth have to dock here to avoid running aground and trains run to the pier head to pick up disembarking passengers. There’s a boating pool and more near the end of the pier and all the usual seaside fun to the east. West of the pier tends to be a little quieter. Bembridge’s mostly pebbly beach is great for shell collecting. At low tide, sand and rocks are revealed and you can idle away hours rockpooling and looking out for fossils. It’s considered to be one of the best beaches on the Isle of Wight for watersports and has views out across the Solent to Portsmouth and the nearby St Helen’s Fort, on the easternmost point of the island. One of the most popular beaches on the Isle of Wight, Sandown has soft sand, a pier, seaside cafes, crazy golf and deckchair hire. It’s a traditional seaside resort so if you want a bit of fun with a bucket-and-spade or to try your luck in the pier amusements, it’s a good one to head for. It’s popular with swimmers and surfers. People have been enjoying the golden sands of Shanklin and rating it as one of the best beaches on the Isle of Wight for at least 200 years. On the south-east coast of the island, it has a traditional English seaside promenade and all the fun of the fair lining the beachside with crazy golf, amusements, ice cream kiosks, cafes and beach shops. If you thought you had a little hope of finding a spot on the sometimes-busy shores of Shanklin, wander left (north) of the main beach to the quieter, appropriately named Small Hope Beach. Here, a cliff face backs the beach with a row of pretty beach huts at its base. The gently sloping sands mean it is a good place for kids to paddle and swim. There’s more traditional seaside fun at Ventnor where you can hire striped deckchairs, windbreaks and even beach huts on a daily basis. The furthest south of the big holiday resorts, Ventnor has a red shingle and sand beach and lots of attractions including a 100-year-old children’s paddling pool with its own Isle of Wight in miniature in the middle. West of the busy beach at Ventnor and accessible only on foot, Steephill Cove is a lovely little beach where you can swim in clear waters and dream of living in one of the fishermen’s cottages that help make this spot so picturesque. It’s lined by pretty painted beach huts and is also a good spot for rockpooling. 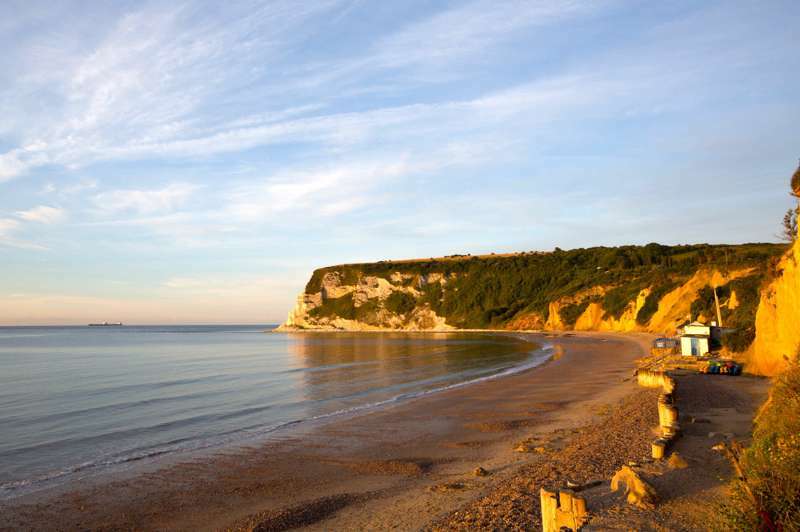 A beautiful beach on the island’s south coast, Freshwater Bay is within the Isle of Wight Area of Outstanding Natural Beauty. Its shore is a mixture of chalk pebbles and grey flint. Sand is revealed when the tide is out and the beach is framed by beautiful chalk cliffs. It is one of the most picturesque beaches on the island and a starting point for a six-mile walk to the Needles too. Another of the Isle of Wight’s best beaches, Alum Bay offers views of the famous Needles chalk stacks and is situated at the island’s westernmost point. The beach is mostly shingle but is well known for having multi-coloured sands, which are used in the typical Isle of Wight souvenir: a bottle of layered sand to take home. You can walk down to the beach from the car park on the cliff top near the Needles Landmark Attraction or go for the easy option and let the chairlift whisk you down from the top (for a small fee, of course). If you are looking for a more natural beach where you can walk and enjoy wildlife, you might like to head for the Hamstead Heritage Coast on the north-west of the island. This area of undeveloped coast is managed to conserve its natural beauty and habitats for wildlife and migrating birds. Inland from the beaches there is farm and woodland where you can spot red squirrels and other animals, while on the coast you can look out for migrating birds and waders such as curlew and snipe. The Isle of Wight Coast Path is a good way to access this area.